When I first got my chickens, I didn't go away at all! I was just too worried to trust someone else with the chicken care for a week. I didn't know where to find a farm sitter and wasn't sure how all that worked anyway. It was about 6 years before I took my first vacation away from my chickens. It took me another year to come up with a system I'm happy with, and now I go away for a few days whenever I'd like. Taking a vacation while you own chickens is not as difficult as I thought it was going to be. It does take a little pre planning to make sure the chickens needs are met while I'm gone though. Many people like to hire chicken sitters, or have a neighbor come check on them. I only do this if I'm going to be leaving my chickens for a week or more. When taking a short trip of just a few days, I've found that the chickens are fine left in their coop and run with enough feed and water. There are a few things that make it easier like automatic doors and special treats in case they get bored. Automatic door: Each of our chicken coops have automatic pop doors that opened into a covered run. The doors are set to open at dawn and close at dusk. I talk about both the pop doors and covered run in 4 Chicken coop additions you can't live without. These doors let the chickens out in the run so they can play and scratch for the occasional bug that wanders in, plus it lets some fresh air into the coop. Feed & water: There are some very large feeders and waterers available at the feed store and most of them could last for several days depending on how many chickens you have. I add a second waterer when I'm going to be gone. I leave one drinker in the coop and one in the run. Boredom treats: Cabbage, apples or cucumbers on a string. Hanging baskets filled with lettuce. Fresh grass clippings in a heap in the run with a handful of scratch underneath. Anything that will give them something to do for a bit will work. If you don't have automatic doors or decide to hire a chicken sitter, they will need to come by at least twice a day to let the chickens out in the morning and back in at dusk. In this case you'll need to meet with them ahead of time and walk through your routine with them. Leave contact information for someone your chicken sitter can chat with if you're not available. Even an online friend who keeps chickens can talk them through the process if a question arises. Make sure your chicken emergency kit is accessible to them in case a chicken gets injured. Write down your avian vets phone number if you use one. Show your chicken sitter where the feed is and how often the chickens should be fed. Discuss how often waterers are just to be refilled and whether they should be scrubbed out also and which sink (or hose) to use. Discuss collecting eggs and where you would like the chicken sitter to put them. I always let my chicken sitter keep the eggs and leave empty cartons for her to take them home in. You'll also want to tell your chicken sitter about any quirks the chickens have like if they have a hiding spot, or lay eggs in weird places. I created a chicken sitter instruction sheet that you can download by clicking here. 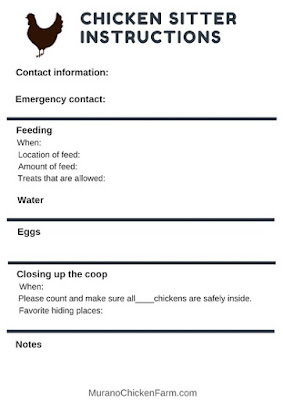 Print the instruction sheet out and fill it in with the information for your chicken sitter to follow. Do a trial run. A few weeks before your trip, set everything up as if you were leaving and then do a vacation practice run. 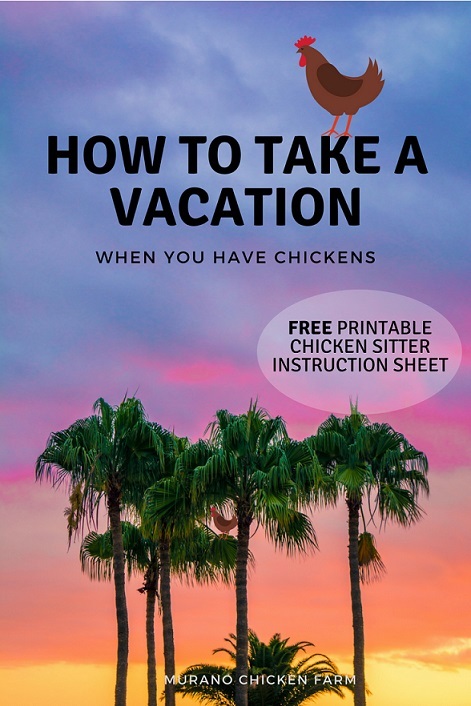 If you plan on getting a chicken sitter, you will play their part and only do exactly what the pet sitter would do but nothing more. Your practice run should be for the duration of the vacation. Observe your chickens carefully during the practice run. Are they getting along? Are they bored? Do they run out of water or feed? This gives you an opportunity to watch exactly what will happen while you're gone and tweak your system if it needs it. Don't be afraid to do several practice runs until you get it right. Buy feed, and not just enough feed for while you're gone but enough feed for several days after too. If something happens and you need to be away longer than you anticipated, your chicken sitter won't have to go to the feed store. Label everything! You may be able to see the difference between grit and oyster shell but will a non-chicken keeper recognize or remember which is which? Scrub all waterers. Slime and bacteria build up quickly in waterers in summer and you want to start out as clean as possible. Clean the coop and change bedding in nest boxes. Poop can build up quickly if the chickens are confined, so it's best to start with a clean slate! Take a walk around the coop and run and inspect for areas that need repair. You wouldn't want a predator being able to get in while you're gone! I don't recommend leaving while you have chicks to care for especially if they are in a brooder. Unless you have a chicken sitter who is familiar with chick care and can stay at your house the whole time, it's probably a bad idea. Chicks can get themselves in trouble and go downhill very quickly so they need checked frequently. I've been doing this for 3 years now and it's worked out great for my flock. Have a great vacation! Thank you for this post—not being sure about care while we're gone is one of the reasons we've (barely) held off on getting chickens just yet. If you don't have a "sitter" what do you do about the eggs while you are gone? If I'm only gone a day or 3 I just let them sit in the nest. Any more than that and I ask a neighbor to come get them.